This week has been all about the roses. They were looking so beautiful with the different varieties in my garden coming into peak bloom together. Seemingly they are more abundant than last year. Previously, I have picked them for fresh hot tea and to float in my bath. Never before have I made a cold water 2 day infusion. Its so simple, pick fresh petals from the flower. Discard any bruised or brown ones. 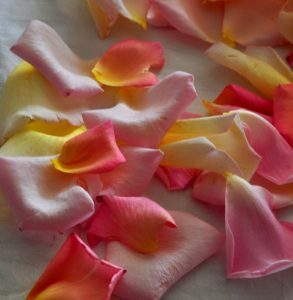 Clean off little bugs who crawl in the centre and amongst tightly layered petals. Immerse the petals in water, when submerged, twice water to petals by volume. Make sure they are submerged and fully wet. I then put a plate to cover the bowl and thats it. Leave for 48 hours and then pour through a sieve to collect the infused water. I like it chilled. Wow, its fragrant fresh, just divine! I love it. I found myself saying.. “Why havent I done this before?.. Why?” I was really missing out. No more! I have had a pint of it every day this week. I sed different colours wither mixed together and then a batch with single colours. it fn doing taste trials to test the palette. I will add, all the roses are unsprayed and well established, very important to use organic roses. 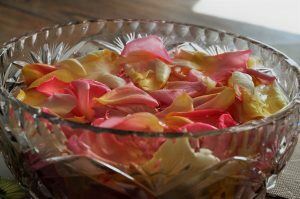 I wouldnt ever trust store bought cut roses for this process. I notice I feel really cheery afterwards but gentled too. I am waiting to hear back from a professional herbalist to find about how many of the nutrients from the petals are extracted with this method. It keeps for about a week in the fridge, longer if its made into a distillate. I looked the method up for this and it involved a brick in foil in a big pan with an upside down lid with ice on. For me right now thats ounds way too much hassle. I will give an update when I know more about the healing potential of taking it in this cold water infusion form. 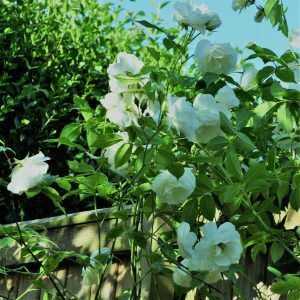 I have read that the rosewater has an astringent cooling effect on the skin and can be sprayed directly onto the skin and it can be good for conditions where there is inflammation. Stinging nettles had such a strong childhood memory of being the ghastlies who interrupted the enjoyment of blackberry picking with their ouchy hot hitting sting its a very pleasant surprise to now see them as joyful, delicious, nutritious precious gifts! I was lucky enough to spend the day with Fred the Forager a few year ago who shared his excellent explanation of their value as a delicacy food and nourishing tonic in the woods at Lacock, Wiltshire. We sat round a fire after a woodland tour of all the edibles as he cooked them, wilting them down a bit like you would spinach with a knob of butter. I havent looked back, a memory was etched deeply there and then, the nettle initiation. I highly recommend any workshop with Fred, his apporach to herbalism is informed, fresh, sensible and dynamic. He has a very intuitive relationship to nature but also has a very deep understanding the the scientific side. Since then I have made nette fritters in batter, nettle sun infusion drink and loads of the long brew infusions. For the sun infusion Take a cold jug of water a bunch of nettles, roughly chopped and a few fresh lemon balm leaves and leave in the sun for a few hours and then strain and drink. Its so delicate frgrant and light, the taste to my buds anyway is heavenly, really. Its full of vitamin C too. Last year I pick them fresh ever day for 6 weeks dried them in a dehydrator and then made overnight 8 hour infusions with the leaves. I made it in 1 litre mason jars qtr by volume to hot water, in other words i put enough dried leaf in the jar to come quarter of the way up the jar. If you have read the oatstraw blog the same goes here, wait until the boiled water has cooled or add cold before adding the boiling water.. thereby bringing the temp downwater to 85 degrees. This prevents destroying the nutrients. From what I understand the nettles are an excellent kindney tonic and they build constitutional qi energy in chinese medicine terminology. I loved the feeling of taking them everyday. I was looking to see if they made a difference to the chronic fatigue and i didnt get a huge result but having said that without taking them tat often them I am on lower levels so its difficult to say for sure ow much of a boost they were giving to my energy. Oe thing I do know is that it was excellent for my skin. It made it very soft and my hairdresser asked me what I had been doing since, a good measure of a ifference over six weeks inbetween appointments.. Also I know it felt intuitely good and very rewarding to be getting nourishment for free from the land. I firmly believe that there are micronutrients available in wild foods not available in cultivaed vegetables. As long as they are picked from a zone away from traffic and other pollutants there is the definite advantage of not consuming pesticides. After June 21st they have a glassy sunstance in their leaves so are best used for teas and infusions only after that time and not for cooking as a vegetable. Nettles are rich in vitamins A, B2, C, D, and K and have important nutrients like antioxidants, amino acids and chlorophyll. They’re also a good source of calcium, potassium, iodine, manganese and iron. Analgesic, anti-rheumatic, anti-convulsant, antihistamine, astringent and hypotensive properties. Each cup of nettles supplies an impressive 1,790 IU of vitamin A, which is three times the recommended daily value. Treating anemia and fatigue due to a high iron and chlorophyll content. Reducing the pain associated with urinary tract infections (UTIs). Relief of arthritis, joint pain and gout when taken internally or used topically. Treating Benign Prostatic Hyperplasia (BPH) – a non-cancerous condition that causes the prostate gland to enlarge, making urination difficult. Reducing the symptoms of hay fever and allergies by acting as an anti-inflammatory. 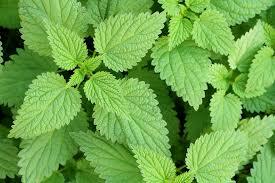 Some research has linked treatment with nettle leaf to relief of symptoms such as sneezing, runny nose and itchy eyes. In one study, 57% of patients rated nettles as effective in relieving allergies, and 48% said that nettles were more effective than allergy medications they had used previously. I was so glad I bumped into an old friend of mine who shared what success she had had taking Sage for her hot flushes which had been keeping her awake at night and that she told me to persist taking it for 6 weeks before making a judgemnet as to whether it was helping. I was getting a sauna style sweat every hour or so in the day and being woken in the night with them too, throwing off hte covers. i was reaching for a new wardrobe – ok yes any excuse! but no really I was needing layers easy to pull on and off as it was like being in different climates within seconds. I am more than happy to share that they have all but stopped. I think I noticed a difference after three weeks, I only ocassionally get a hint of how they were before I started. 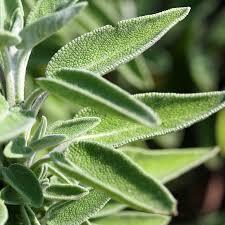 I am taking a few other things regularly like fish oils and evening primrose oil flower essence and pine pollen powder but thats for another post and I am confident enough to feel that the sage has been a major player in this change of the menopausal symptoms to give it a bug thumbs up.